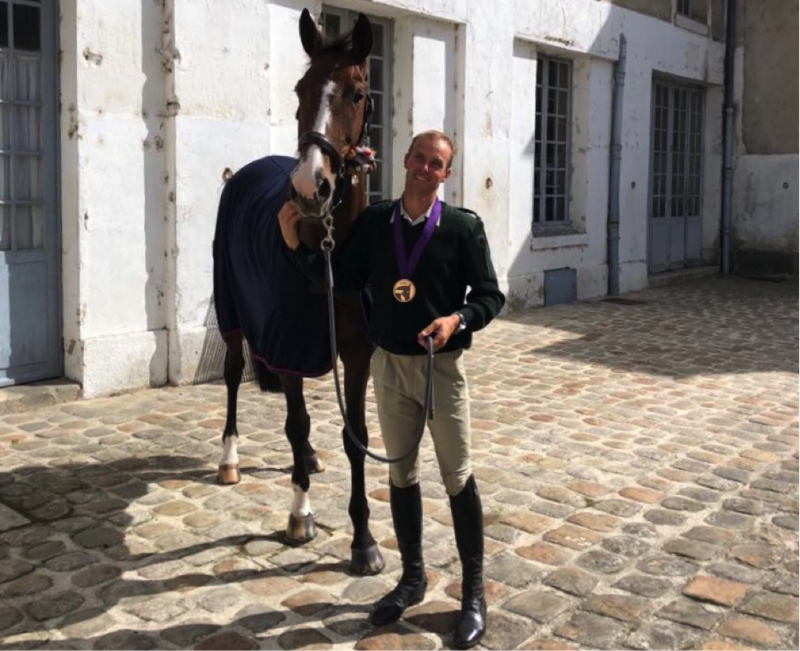 Just back from the WEG, we went to visit Donatien for a small interview, the opportunity for our favorite warrant officer to come back to his first participation in the World Games. What was your state of mind as the WEG approached? I was relaxed, unfazed. I rather put myself under pressure way before the Games with all this qualification system. Even if my mare was qualified, it was necessary to get ready and run well the trials that served as selection. It is in those moments when small wounds can happen. I had to prepare her for the effort and at the same time not overtrain her during this preparation not to tire her. Once the selection came out, I was unfazed because I knew my mare well. I trusted her. I was quite relaxed for all the tests in Tryon, focused but relaxed at the same time. The horses had time to settle in. We arrived early to recover from the trip and while recovering they had to adapt to the difference in temperature and to the very hot and humid climate. When we rode at 3pm it was a bit complicated for the horses and even for us. We have been there gradually. At first, we rode rather early in the morning and progressively we changed the schedule to start working under the heat. Then everything became clear as the final schedules came out. We knew if we would have to ride in the morning or the afternoon. As an opener, I benefited from good conditions to compete. I tried to get closer to her schedule to train her and to prevent her from getting too hot and suffering from the heat. On the day of the cross-country, it was much less hot than the days before with the storm approaching close. There was air and we had lost 6-7 degrees compared to usual. We even had rain. How did you feel Pivoine? How did she behave? What are her strengths / weaknesses? Pivoine does not have much strength and it can be felt in her movement and locomotion. She is fast enough; it becomes a quality for the cross-country but also a difficulty for the dressage. I knew that when we got there I could get everything I wanted from her. I knew she was going to react exactly as I wanted to, whether on the dressage arena, where I was able to concentrate on doing precision work, or on the cross-country and jumping courses. She was not too surprised despite the atmosphere of the world championships, the terraces ... She was even rather relaxed. She certainly felt that I was relaxed myself. The mare felt quite comfortable and was quite focused as well. She is an old mare and I’ve known her forever. If a trial goes bad, I know how to start over on the next one. This is important to ignore what we have done for example in the morning and to be able to start over in the afternoon. On the day of the dressage, in the morning, we had an arena with corners market out by ground poles. But she does not like ground poles at all. She was slightly tense but in the afternoon we compete as if nothing had happened. How did you handle Pivoine during these Games? She has been managed as a usual deadline. Do not make them feel that this is different from another deadline. There may be more pressure and challenge but the way of running remains the same. For my part there was no difference in the management of the mare. What was the easiest and most difficult trial for her? Usually the easiest trial for her is the cross-country. Finally, in Tryon it was the Dressage. On the cross-country, the topography was quite difficult for horses and she is not a good mare for slopes. She did everything right on the technical side but she suffered a bit with this big slope at the end of the course. I had to listen to her carefully, she get going again after all but asked to catch her breath at the end of this slope to fill her lungs with oxygen and regulate her breathing. Often everything happens during the cross-country course. Being focused under pressure is always difficult to manage. Technically we were up and running. The major difficulty was the management of stress and pressure rather than a trial itself. Within the team, there was a very good atmosphere. We lived together for 3 weeks during the training course in Granville. We all knew each other well and we were all respectful of each other. It helps to have a nice atmosphere. Everyone wanted all the riders to finish, in good conditions and with the best results possible. For the mare, I am not sure for now. We wanted to let her recover and rest. She will not compete by the end of the season. For the last two years, she has been preparing the WEG and she has completely fulfilled her mission. She started her sports career very early as she went to the Lion d'Angers at 6-7 years old. She was also very young when she started competing at high level and she has been doing this for the past 10 years. So we wondered with my wife if we were not going to take advantage of this beautiful performance to end her career, but nothing is decided yet. Regarding the other horses, I could not go to the 5-year-old final that took place straight after the WEG. I do not like rushing things and I a concerned about doing them especially in good conditions so that the horses make the most of their competition. My 5-year-old Dgin stayed home. He is not late so I'm not worried. He has grown a lot this year and has physically changed. It is a horse that I value for the future so I want to be patient. He was in Granville with me and showed some very nice things there. On the other hand, I was keen to perfect the training of my 6 years old horses. Same, they were not qualified for the final. I had a horse that started competitions this year, another very good one who had won the 5 year-old final last year that could have been good but I missed a show when I got sick in July. So I went to Lamotte Beuvron to get them down to work. I have also a 6-year-old and a 7-year-old who will compete in the CCI* of Lignières in order to make them gain experience and perfect their training. Finally, I have a last 6-year-old who will compete several events to catch up. I will also get down to my jumping horse, Sprinter, who did not do much this year, only 3 courses. For a jumping horse, it's not enough. He ran the Grand National in Jardy and in Villers Viscount. We are organizing a jumping event, the 3rd weekend of October so he will resume competition at that moment and then the “Grand National” track or indoor events. During the Games, did a couple particularly impress you? Several horses impressed me, but above all there was a horse that intrigued me. These are the horses of the British and New Zealand competitors and especially the horse of Jonelle Price who climbed this famous slope at a phenomenal speed. This proves once again that warm-blooded horses are needed for this discipline. Sydney Dufresne's horse, Trésor Mail, impressed me a lot. It is a nice horse, I followed him on all the preparation and it made me want to maybe, try this stallion on Pivoine when retired. What was your best time in Tryon? At the end of the jumping course, when suddenly everything ends. The mare has just made a beautiful jumping course, and that was no easy job as it is a complicated mare when jumping. And the moment the course ends, we can finally catch your breath and ease off on the pressure. This is a rather appreciable moment. Thursday, 11 October, 2018How Seaver helped Louise monitor the symmetry of her mare experiencing serious lameness issues?